Another fairly unique and very convenient feature is that you can walk right off the family room balcony steps to the steps to the beach. Families love this. Blue Tide 7B, in Seacrest, Florida, is a beautifully furnished and decorated 3 bedroom condo (includes the loft), 3 full baths, 2 balconies overlooking the amazing Gulf of Mexico, is very spacious with over 1800 square feet of living space. The beaches have been voted as one of the best of 'Americas Beaches'. YOU CAN WALK RIGHT OFF THE FAMILY ROOM BALCONY TO THE STEPS TO THE GEORGEOUS WHITE SANDS OND EMARLD WATERS OF THE GULF. This is fairly unique feature that is so convenient. 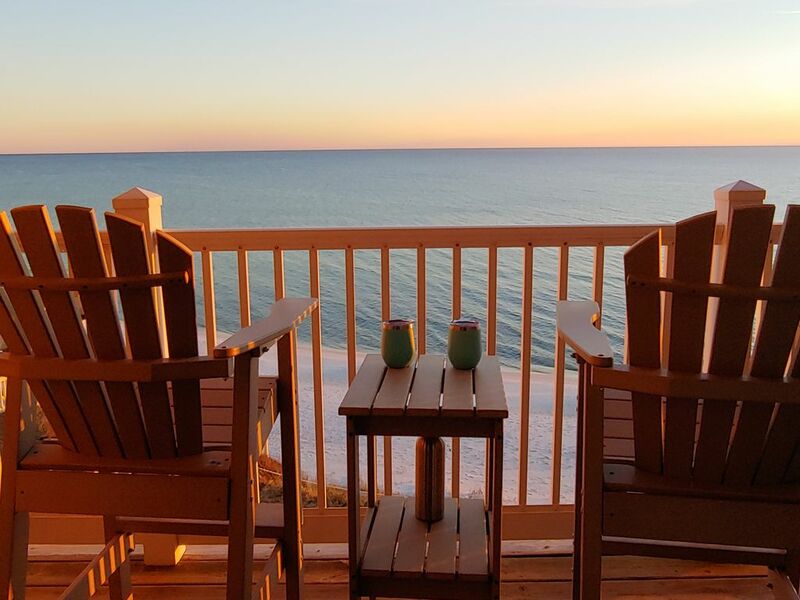 The condo is located on scenic 30-A, 2 miles west of Rosemary Beach and Alys Beach and a few miles east of Watersound, Seaside and Seagrove Beach. I get a lots of compliments about how the condo is decorated and how comfortable it is. The condo is fully furnished to make you feel at home when you stay there. It is located on a 17 mile bike trail that runs along 30-A. This is lot's of fun for families. Bikes can be rented and delivered to the condo. The Blue Tide has about 200 linear feet of private gulf frontage. There are only 18 condos in this quaint, quiet, family friendly complex. It provides a wonderful atmosphere for a fantastic family vacation and a place to create life long fond memories. I have so many families that have been back now 3 and 4 times. Many say they treasure there time spent at the Blue Tide and can't wait to get back. I feel the same way. There are 2 grills in front of the complex next the parking lot for use. There are laws preventing grilling on the balcony or behind the complex. This is a non smoking condo. It is not allowed. How can you not love the sugar white sand and the emerald gulf. The views blew me away when I first stayed at the Blue Tide and I took advantage of a buying opportunity. I have loved every minute of it and get excited everytime I come back. The sun never comes directly into the condo so you never have to close the drapes. You have incredible Gulf views all day long from the master, dining area, kitchen and family room Also, a big plus is you can walk right off the family room balcony to the steps to the beach. We loved the spacious, well equipped condo. Loved the two porches looking out on the beach. Great place to bring the kids. Family oriented, beaches are not too crowded and many great places to eat near and far. Hope to come back soon! This unit is very spacious and comfortable, and we really enjoyed looking at the beautiful shore birds and dolphins. Walking on the beach and staring at the water is the sort of R&R we were looking for. Beautiful family friendly retreat-must see! This town home was much larger than we expected & easily accommodated our family of 5. The beds were incredibly comfortable, the kitchen was well equipped & the view was amazing! Easy access to the beach via the sliding glass doors on the main level made our daily trips down quick & simple. The daily chair/umbrella set up included was a definite bonus-we even took advantage of the additional setup at the owners discounted rate. Based on his recommendation, we tried out a few local places & they were all a definite treat: The Perfect Pig (best bacon ever! ), The Hub (great family friendly environment), Goatfeathers (amazing fresh seafood to cook yourself), Donut Hut (our kiddos loved the treat) to name a few. Everyone knows renting for a beach get away means you need to provide your own meals, but here are a few items we didn't think about when we stopped at Publix before check-in & had to go back out: laundry detergent, dishwasher detergent, scrubbers for dishes, paper towels, any/all cooking spices, coffee filters (standard round shape-our home coffee maker uses cone shape), cleaning supplies for during your stay, trash can liners, toilet paper (1 roll per bathroom was provided), charcoal (2 grills out front are very nice)...hoping this will make others packing/planning a little bit easier as we just weren't as prepared as we thought! Communication with Brad, the owner, was seamless. He was incredibly attentive before we arrived and thankfully, we did not have to contact him at all during our weeklong stay. Our children really enjoyed the pool multiple times when they were tired of fighting waves & sand in their trunks. Starting the day with a cup of coffee on the deck or ending it with a glass of wine in the same spot...we did both & it was bliss. Thank you for sharing your beautiful spot of 30-A! My family and I had a wonderful vacation in this condo. It was the perfect location for relaxation and the views couldn't be beat. We felt like we had so much privacy and the condo was beautifully decorated, and we felt right at home. We saw dolphins every day & even a stingray! It was an unforgettable trip. I highly recommend!!!!! Just got back from Blue Tide 7B... and our family vacation was AWESOME! The condo was impressive... huge & comfortable! Excellent location... gorgeous views... and LOVED the uncrowded beach! We will definitely rent again! We took my 3 children (ages 7, 4, and 2) and my parents to this condo. None of us wanted to leave! Besides the amazing views and beautiful white sand beaches and clear water, the location could not be beat! We brought bikes and had access to many of the areas amenities, including The Hub (restaurants and outdoor movies/music) and Alys/Rosemary Beach areas where there are plenty of dining and shopping options. The condo itself was clean and spacious and well-decorated, and the loft area was perfect for my two older children to share (the main master suite had plenty of room for a pack-and-play for my youngest). All beds were incredibly comfortable. Both bedrooms had attached bathrooms which was very convenient for travelling with other couples, and the downstairs full bathroom was a nice bonus. The pool was never crowded and made for a nice break from the beach or for an evening swim. Additionally, the beach was never crowded. We look forward to staying here again! The only suggestion I would make would be smaller furniture on the balconies, as the furniture there now is quite large and hard to maneuver around, at times, and also hard for little ones to sit on. Great place! !